First cast by Berthold in 1899. The initial style is credited to Peter Schorr. Expanded into 5 styles until 1902. 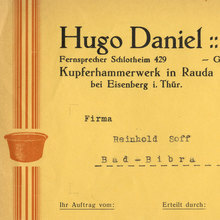 In 1911, a 6th breitfett (extrabold extended) style completed the family. [Reichardt] Came also with a set of decorated initials. A Cyrillic version was named Latinskaya , which provided the base for Literaturnaya . In 2010, Gerhard Helzel digitized the Regular (used for the sample) and halbfett (bold) weights, based on a large size.